How to Pick the Right Pressure Washer Nozzle - Best Guide 2018! The nozzle is one of the crucial parts of a pressure washer that affects your cleaning deeply. It is an accessory that needs to be attached to the tip of your spray gun and it decides what kind of water spray is going to come out at what speed. Based on different kinds of cleaning the companies came up with various types of nozzles. You need a broad idea about these types so that you can choose the best pressure washer nozzles and can make your cleaning effective and smooth. For example, if you cut the potato with a big knife that is used to cut meat from the animals’ body it will not be proper. You need a small kitchen knife to cut the potato to make your fries perfect. Depending on the delicate surfaces of your cleaning object you need to choose the nozzles carefully. It might seem very complicated for you but in reality, it’s very simple. You just need a good idea about these parts and know how to attach them to your spray gun. It is a careful task to find the best pressure washer nozzle. When you buy a pressure washer you will get a set of different types of nozzles, the number varies machine to machine. They will be of few different colors which indicate its power and differentiate from one another. Pick the red color one which is the most powerful nozzle of all and it is called blast. You will get a 0-degree spray which will be like a pencil point; be careful with it. Next, pick the yellow color. It is also quite powerful which gives you a 15-degree water spray. After that, take green color nozzle. This one is used in most of the cases; it’ll provide you 25-degree spray. The white color comes next. It will provide you 40-degree water spray. You can use this nozzle to clean your normal dust. The black nozzle provides you 65-degree water spray and its power is the least. To clean very light dust you can use this. There is a soap applicator nozzle which allows you to spray the detergent on a surface. You will not get much power in this also. Some nozzles are rotary nozzles which rotate while spraying. This will cover the 360-degree surface while cleaning. 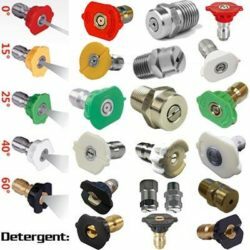 You might find some best pressure washer turbo nozzles that you will also help you greatly in your wash. Check Nozzle Tips on Amazon! Usage of the Nozzles: Till now you learned about the nozzles depending on their colors. Now we will discuss the usage of different nozzles. This is the 0-degree nozzle. You will get a very thin spray like a pencil point. This one has the capability to cut through your flesh. For this, you need to be very careful using it. This can be used to clean the corners of your patio, driveway, tiles and very hard and tough dirt such as oil stain, grease, etc. You can even use it to remove your old paint from the wall. To spray at the very higher place it will provide you a good help. This nozzle’s color is yellow which is also quite powerful. This one too can cause injury to you so, it requires a careful handling. You can use it to clean the tough dried mud, oil and grease stain, patio, driveway, your garage, etc. This nozzle also is quite powerful and its color is green. To clean the tough dirt or stain on the surface of your car, tiles, walkway, bathroom, and kitchen it will help greatly. This nozzle is used mostly by the users as it has the medium power, not too strong not too light. People use this nozzle also quite often as it doesn’t have much power. To save their delicate surfaces they prefer it. It washes the dirt softly from your car, motorbike, floor, or any other delicate stuff. Among many pressure washer nozzle tips, this one provides you the least power and covers a wide area at a time. Normal dust, or just to spray water this nozzle will be best. After applying the soap you can wash the area with it. To make your car or boat you might need to apply soap or detergent on its surface. With this nozzle, you can apply detergent which is previously mixed. Some machines have the detergent tank but for the others, you might have to use your bucket. These nozzles spray water through more than one point and they rotate while spraying the water. These are used to clean your mosaic or tiles floors, roofs, patio, etc. These nozzles generally don’t come with your machine; you might have to buy them separately. Now you know that what nozzle to use for what purpose. See all you want to clean places and decide what nozzle can be used for what surface. Some people use pressure washer nozzles for the garden hose. If you also have this intention you should first check which one will work with your garden hose.